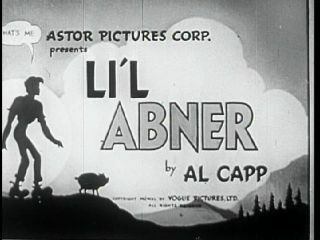 Li'l Abner (1940)- This is a wonderful, funny movie with charming country humor! I like this film and the much different 1959 film, but I'd have to say that I like this film better. This is a straight-ahead comedy, where the 1959 film was a musical based on the Broadway play. In this film, Daisy Mae pursues Li'l Abner. Abner tries his best to avoid her. He actually likes her quite a bit, but he's nervous around girls so he stubbornly refuses to fall in love or get married. FYI: In later years of the comic strip Abner and Daisy DO marry. When Abner eats a bad sandwich and gets sick, he goes to visit someone he thinks is a doctor. Abner actually finds a wise-cracking barber who fools the silly young hillbilly into thinking he will die within 24 hours. Since Abner believes he will die by tomorrow, he does a lot of foolish things thinking he'll never live to regret them. He agrees to marry Daisy Mae and another girl named Wendy Wildcat, and makes enemies with an escaped criminal named Earthquake McGoon in order to collect the big reward money ($25.00) for his Mammy and Pappy. When he finally realizes he's not going to die, Abner is in quite a situation. Daisy and Wendy compete to marry him in the Sadie Hawkins' Day Race, where women catch eligible bachelors. In order to save Abner from Wendy, Pappy frees Earthquake McGoon from prison in order to stop her. Earthquake instead seeks out Abner for vengeance. So now Abner has to worry about three people chasing him. To make a long story short, Daisy catches Abner. However, Abner is not to be caught so we see him running from Daisy Mae as the movie closes.